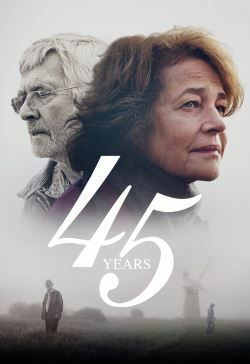 Kate Mercer (2016 Best Actress Academy Award nominee Charlotte Rampling) is excitedly planning a party to celebrate her 45th wedding anniversary. One week before the celebration however, a letter arrives for her husband, Geoff (Tom Courtenay). The body of his first love has been discovered, frozen in the glaciers of the Swiss Alps after a tragic accident on a hiking holiday in 1962. Though Kate continues to prepare for the anniversary, she becomes increasingly concerned by Geoff’s preoccupation with the accident and with his past relationship. By the time the party comes round, there may not be a marriage left to celebrate.